Brian McElroy had always wanted to own a farm supply store. 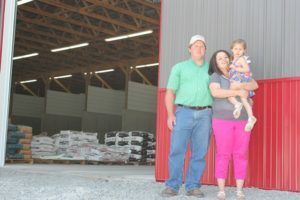 That dream came true in 2010, when McElroy and his wife, Natasha, purchased the Russell County Farm Store. The business, located in Russell Springs, is a livestock feed manufacturing facility offering a full line of feed, farm and pet supplies to its customers. Custom-mixed feeds are provided for individual farms by taking forage samples and blending grain mix to provide the right nutrition for the livestock. McElroy learned the business by working there for several years – always with the goal of buying it. He has more than 20 years of farming and beef production experience. 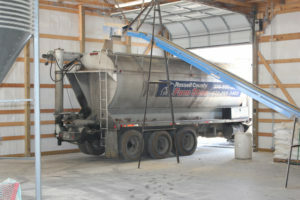 The feed mill has served the area since the late 1950s, and one of McElroy’s top priorities after purchasing the business was to improve the accessibility and deliver of custom bulk feed. Thanks to financing from Kentucky Highlands Investment Corporation (KHIC) and Southern Kentucky Economic Development Corporation (SKED), McElroy was able to build a new addition to the business. The 12,000-square-foot bulk mixing facility has 15 ingredient bays that will hold approximately 50 tons of product per bay. Today, there are eight full-time and four part-time employees at Russell County Farm Store, which serves Russell and several surrounding counties. Kentucky Highlands Investment Corporation first started working with Russell County Farm Store in 2013. KHIC was uniquely positioned to work with the company and SKED because it has two lending officers with considerable practical agricultural experience. Edgar Davis, who works primarily with the company, comes from a farming background and has a Bachelor of Science degree in agricultural economics from the University of Kentucky. Gene Bundy is a cattle farmer and a former employee of the USDA Farmers Home Administration.